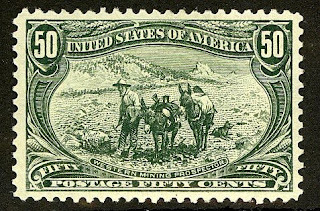 There are some stamp-issuing entities which issued only a few stamps, making it simple (though not necessarily inexpensive) to form complete collections of them. 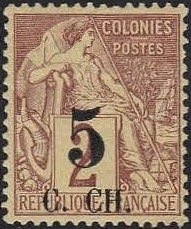 Such is the case with Cochin China, a former French colony encompassing the southern third of Vietnam, for which the French issued five stamps from 1886-88. Stamps of the colony were superseded by those of Indo-China in 1892. The five (Scott #1-5) are all French Colonies General Issue stamps surcharged for use in the colony, and though printing quantities are not known, I would estimate that they were produced in the low thousands (for #1, the scarcest), to between ten and twenty thousand for the others. Scott '11 Catalog values for the stamps unused total $430.-. 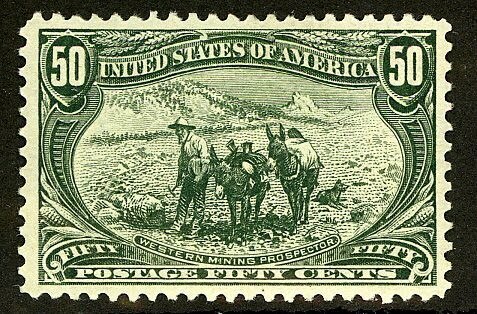 In addition to the basic stamps, six surcharge errors are known. The inverted surcharge of the 5c on 25c yellow on straw (surcharge type "b"- Scott #3a; CV= $200.- ) is the most common, and perhaps a few hundred exist. The five surcharge errors of #4- the 5c on 25c black on rose, surcharge type "c"- are all very rare to extremely rare. All of the surcharge errors should be purchased conditional on obtaining expertization. All stamps of this former colony are worthwhile investments, especially the surcharge errors, which have been overlooked because of their obscurity and because they rarely come up for auction. Stamps of Cochin China have multiple market appeal to collectors of French Colonies, Indochina, and Vietnam.